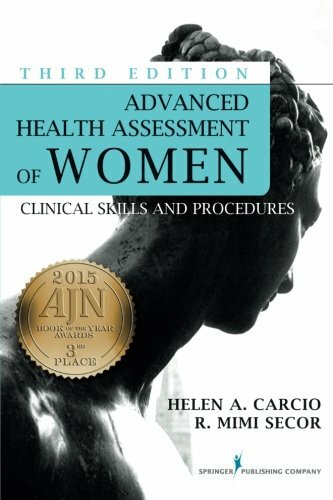 This is the only truly comprehensive advanced text for the assessment of women’s health, written for such primary care providers as nurse practitioners, physician assistants, and certified nurses;midwives. It encompasses both foundational and cutting-edge physical and psychosocial information in a clear and concise outline format, and is unique in its presentation of more advanced techniques and procedures not addressed in standard graduate assessment texts. Keeping pace with the expanding scope of advanced practice, the third edition provides several completely new chapters authored by renowned specialists, expanded chapters, and updates. This includes new information on contraception, domestic violence, health history of special populations, lesbian health, evaluation of the pelvic floor, aging and menopause, bleeding irregularities, infertility, skin aesthetics, pelvic pain, and health guidelines. With an integrated approach to treatment, the authors delineate the expanded roles of advanced health care providers, including guidance for situations when a practitioner must decide whether to act independently, co-manage, consult, or refer. The authors provide in-depth descriptions enhanced by plentiful tables and figures of each assessment skill and technique along with its underlying rationale. Basic techniques are augmented by the inclusion of possible alterations for a particular procedure. On a continuum from simple to complex, the text is divided into 11 units that cover basic women’s health assessment down to the cellular level, health history, prenatal assessment, investigative procedures including sonohysteroscopy and simple cystometrogram, and several chapters on specific women’s health concerns. A special chapter on urinary incontinence includes diagnosis of bladder dysfunction. Sample assessment forms are integrated throughout, as are comprehensive lists of equipment required for each procedure along with information on patient preparation and follow-up.